Puree soups offer clear, rich flavors, but sometimes they can look a little ho hum. Here are some quick and easy ways to make even the simplest soup look like it came out of a restaurant kitchen using fresh herbs, squash blossoms, and/or heavy cream. Very briefly frying some herbs in hot oil will crisp them up, accentuate their natural color, and take their flavor in new directions. Fresh sage leaves are the chef favorite for frying, but flat-leaf parsley and basil will work too. More delicate herb varieties won’t fry well by themselves, but some varieties, such as shiso leaves, can be fried if dipped in a protective coating of tempura batter first. Check out our Perch Fish & Chips Recipe for a great basic tempura batter recipe. Use a high smoke point oil (peanut, grapeseed, etc) heated to around 280-300°F. Herbs fry extremely quickly…they should be ready to come out after only a few seconds, as soon as they darken uniformly (but before they start to blacken). Gently pat fried herbs dry right when they come out of the oil. If there’s enough hot oil clinging to their surface they will continue to cook and can go from tasty to unpalatably bitter. Squash blossoms have a very mild flavor that won’t compete with your soup for the spotlight, but can add a splash of color and a different texture. They can be added raw, but crisp up nicely if carefully fried. Use a high smoke point oil (peanut, grapeseed, etc) heated to around 375°F. Squash blossoms are pretty delicate, so use a basket or spider to gently move them to and from the hot oil rather than tongs. Tempura batter can be used to make squash blossoms even crispier (and less fragile). Putting a small hole in the stem-end of the blossom can help keep an air bubble from forming there, making the squash blossoms less buoyant and easier to fry. If you’re still having difficulty submerging the blossoms, try weighing them down under the surface of the oil with a fryer basket or holding them down with a spider. If the flavor of your puree soup is thick enough you can add heavy cream, either poured into the center to make a pool or drizzled to make pretty patterns on the surface. Make sure your soup’s flavor is strong enough to stand up to the influx of cream, which will make it smoother and give it a more luxurious mouth feel, but can flatten the flavor profile of mild soups. 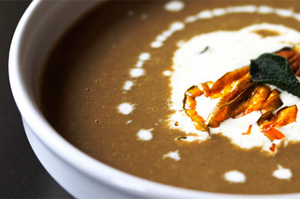 Darker soups will offer better color contrast with the white cream. You could also experiment with flavoring/coloring the cream or even embedding a cream soup within a puree soup. Heat the cream prior to adding it to the soup bowl. A good rule of thumb is to scald the cream (heat it just until small wisps of steam begin to rise). If you add cold cream your soup will soon be cold too. Depending on the density of your soup, you may have to build up cream below the surface to have it continue to show as a decoration. Keep this in mind when planning your design so you don’t have to add too much cream. Experiment with gently drawing just the point of a butter knife through small pools of floating cream. Done correctly, you can turn a round pool into a heart, the point of an arrow, or various kinds of swirls. Practice on soup you won’t be serving to guests so you can do it quickly and accurately for company later.